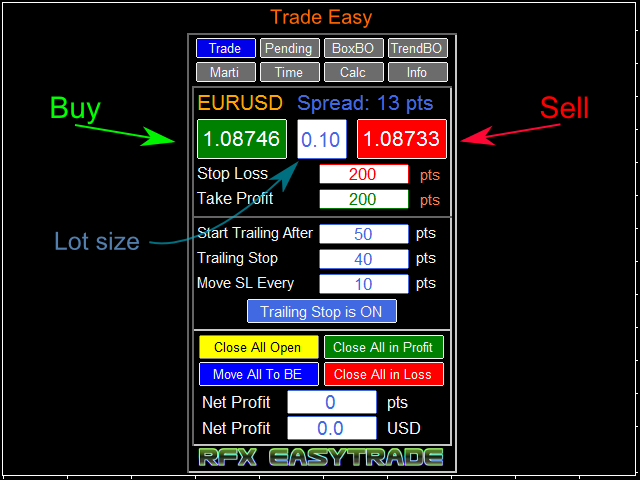 RFX EasyTrade is a professional panel to make your trades as easy as possible. 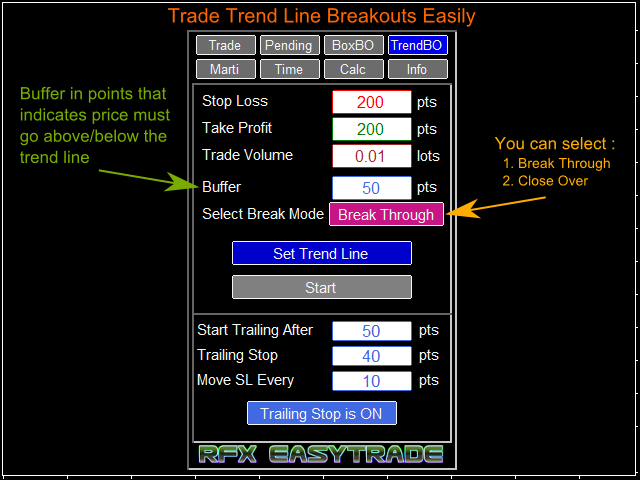 You can perform scalping as efficient as possible, draw a box or a trend line and let RFX EasyTrade to catch a breakout and manage the trade. You can set pending orders and set Order-Cancels-Order easily. 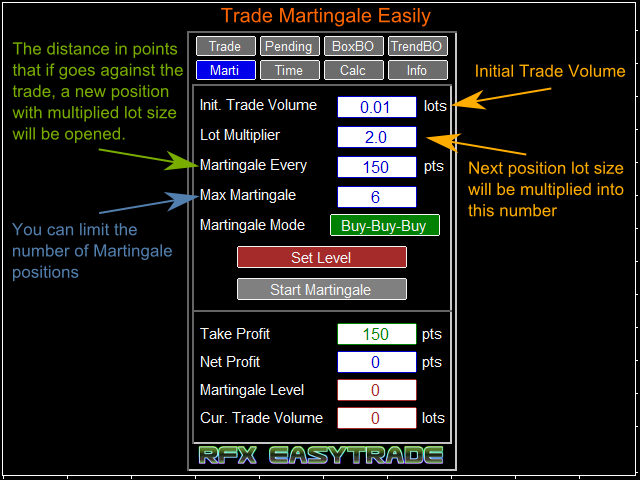 If you are a fan of Martingale strategy, just set a few settings on the panel, and let RFX EasyTrade to perform the rest. 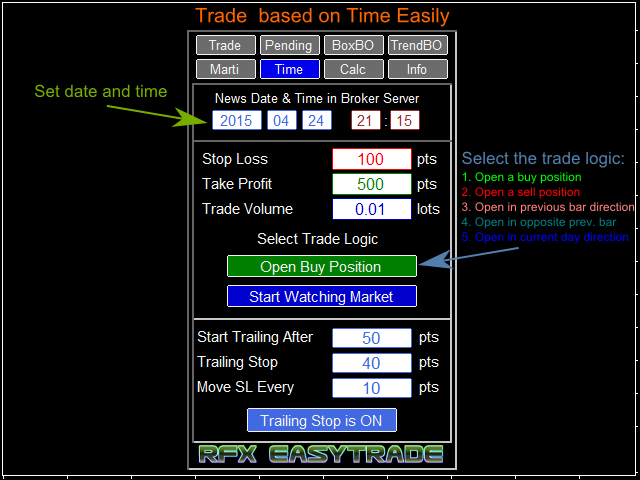 You can trade based on time, just set the timer and a trade will be opened and managed automatically. 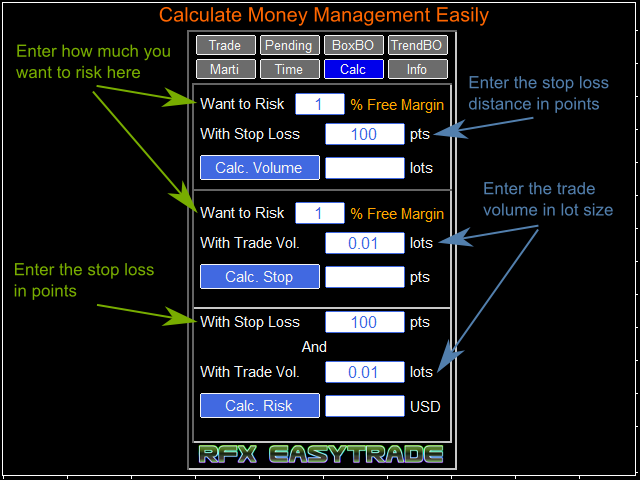 There is a very simple Money Management calculator that lets you calculate the risk, lot size and stop loss of your trades just in one click. 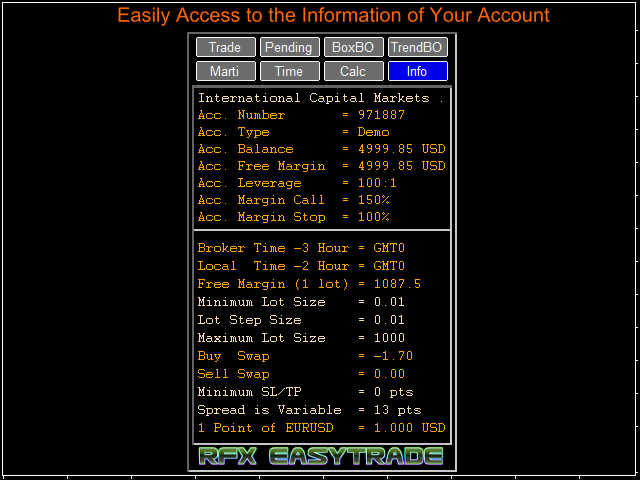 Do you need to access the information about your trade and the currency pair trading? Just click the Info tab and you will see all information you need. Slippage (pips): Slippage value in pips. It is recommended to set this value basing on your brokers' average slippage (default = 1.0 pip). Note: This panel needs Arial font, which you can download from the Comments section. It is one of the standard pre-installed fonts in Windows OS, though. - Fixed a bug that caused the panel prevent the other charts from being focused. - The panel saves and restores the settings for each symbol separately making it easy to return back to the previous session after restarting MT4 terminal. - Now user can select the location of the panel to be on the right side of the chart. - Now the chart objects (e.g., a horizontal line) that user adds to a chart will be automatically drawn in background. - A bug in OCO function fixed. - A bug in Martingale function fixed. - A bug that prevented Info tab from updating is now fixed.